LC-MS/MS based assays have seen wide adoption for the quantification of therapeutic peptides and proteins in biological matrices. The typical procedure for a protein therapeutic is enzymatic digestion and quantification of either universal or signature peptides depending on the matrix background. In recent years immunoaffinity sample preparation techniques for sample purification and enrichment before digestion have been widely investigated. There are multiple reasons for the implementation of hyphenated immunocapture-LCMS/MS. One of the key benefits is the significant increase in selectivity and sensitivity that can be achieved by combining the two techniques in addition to wide dynamic range and excellent robustness and reproducibility. 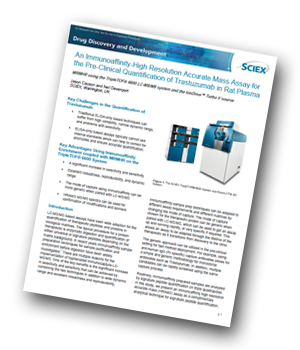 Routinely, immunoaffinity prepared samples are analyzed by signature peptide quantification on triple quadrupoles. In this study, we present an immunoaffinity high resolution accurate mass (HRAMS) assay as a complementary analytical technique for signature peptide quantification. The assay performance is measured using Trastuzumab in rat plasma as a case study. To download your copy of this technical note complete the form opposite.